Although Chevrolet didn't introduce the El Camino until 1959, what if they had decided to unleash their unique utility vehicle on the world one year earlier? Behold the El Nomado, a well executed custom vehicle currently listed on Ebay that answers that exact question. Even with a lot of modern custom touches, this one of a kind vehicle does a pretty good job illustrating what a 1958 El Camino might have looked like. The concept of a bed on a car wasn't exactly new in 1957 when Ford introduced the Ranchero, but it was the first time one of the big three car companies made and marketed a car based utility vehicle with an open bed to the American public. In somewhat typical GM fashion, it took two years before they came up with an answer to the Ranchero in the form of the El Camino. As car enthusiasts with a love for the car with a bed body style, it seems only natural to wonder what the earlier El Caminos might have looked like if the model had been introduced along with the Ranchero. The copper custom Chevy seen here is a pretty good answer to one half of that question, and looking at the result makes us wish El Camino production began at least one year earlier. If you can look past the oversized wheels and the upholstered bed, what you'll see is the marvelously constructed custom El Nomado. 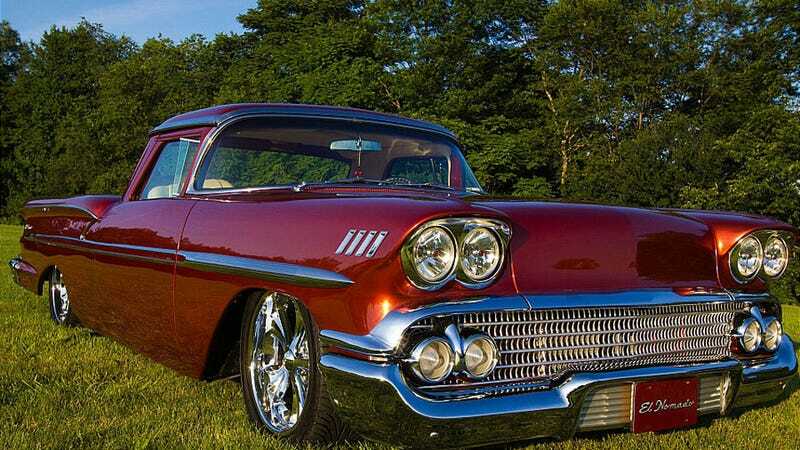 This one of a kind take on a 1958 El Camino was given its name because the body is a hand fabricated mixture of a 1958 Biscayne sedan and a Nomad wagon from the same year. As you can see from these beautiful pictures, the result is a drool worthy creation with more custom touches than you can count. From the Nomad sourced hinged rear window to the air ride suspension system, it appears nothing on the El Nomado has been forgotten. Even the period correct 348 V8 and two speed Powerglide automatic transmission have been rebuilt and perfectly detailed. Even if some of the custom touches are too much for our tastes it's hard to argue with the concept and execution of this beautiful "what if" 1958 El Camino. Bidding for the El Nomado is currently at $40,000 with a little less than two days left, but something tells us it's going to take quite a bit more than that to make this "one of none" El Camino yours.